Teacher wellbeing is directly affected by the culture of the school. All of these factors indicate the state of the culture of any organisation. While students are at the heart of what a school does, the culture of the school is determined first and foremost by the staff. All teachers are leaders- you lead your students, you lead your colleagues, you lead parents and you lead in your community. When teachers are stressed, overwhelmed and burnt out they are less likely to be resilient, flexible and tolerant and find it difficult to be motivated and to give their best. Happy teachers are more effective teachers. Happy teachers build more productive relationships with students, parents and colleagues and happy teachers contribute to a positive school culture. All schools could benefit from examining and assessing their current culture or climate and then creating a shared vision for moving forward. A Teacher Wellbeing Symposium in the Northern Territory in 2014, revealed some important facts about how teachers feel, what teachers want and what can be done to improve teacher wellbeing and consequently student wellbeing and achievement. None of the information would be a surprise to anyone in education, but it is a timely reminder of the best use of our efforts. 1. Teachers need to feel valued. Acknowledgment, feedback and recognition for the job they do is important for them to feel respected, appreciated and empowered. 2. Teachers want to have a voice and be treated as professionals. The way staff are treated by senior management is reflected in the way staff members interact with each other, finally presenting in how staff treat students. Teachers need to be involved in decision-making that affects their work. 3. A work life balance is essential for teachers to manage the demands of the profession. Teachers will often go above and beyond what is expected, but they increasingly feel that this goodwill is being taken for granted. 4. Teachers recognise that positive teacher-student relationships are important for effective learning, and want time to get to know their students. With the heavy curriculum-content focus in many schools, teachers feel that they spend their days teaching subjects rather than teaching students. 5. 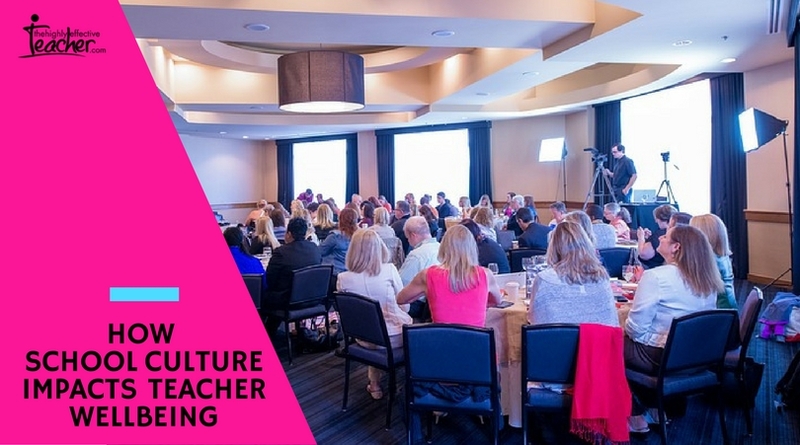 School culture matters and teachers want school leaders who value them as people, build teams based on trust, treat them as professionals and give positive feedback for their efforts. Many schools have developed a toxic environment where there is ‘low social capital, fear and lack of trust.’ (Roffey, 2014). All members of the school community (including teachers) must feel safe physically, emotionally and psychologically if they are to function at their potential. 6. As part of a positive school and staff culture, teachers need to have a focus on relationships with colleagues and their own wellbeing. Positive and supportive communication between colleagues and between staff and management can increase job satisfaction and wellbeing for teachers. Teachers are involved in a thousand interactions daily, and it is the quality of these interactions that determine whether a teacher feels valued and supported in their wellbeing, or whether the culture is toxic and damaging to members (Holmes, 2005 in Roffey, 2012). It is easier to look after your own health and wellness in a school that recognises and values teacher wellbeing, and supports teachers to focus on healthy practices. Teachers need professional development to promote and maintain teacher wellbeing. Teachers part of this study asked for teacher wellbeing PD to be widely available, even to be standard practice. A positive school culture that includes high expectations, respectful and dignified treatment, positive interaction with colleagues and recognition for effort and achievement is essential for both teacher and student wellbeing. Marzano, R.J., Marzano J. S. & Pickering, D.J. (2003). Classroom management that works. Research-based strategies for every teacher. Alexandria, VA: Association for Supervision and Development. McGrath, H. & Noble, T. (2008) The positive educational practices framework: A tool for facilitating the work of educational psychologists in promoting pupil wellbeing. Educational and Child Psychology. Roffey, S., 2012, Educational & Child Psychology Vol. 29 No. 4 © The British Psychological Society.